The new year brings new music to the Mansion at Strathmore, with seven World and DC-area premieres in its January and February Music in the Mansion concerts. 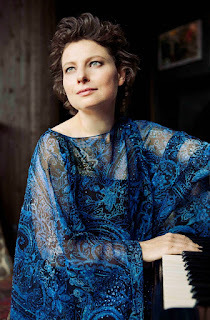 Pianist Yael Weiss unveils her 32 Bright Clouds project, an expression of unity and peace during turbulent times that pairs the 32 Beethoven piano sonatas with 32 newly-commissioned short piano compositions from 32 composers in 32 different countries spanning the globe. This first installment of the project features five world premieres by composers from Iran, Syria, Jordan, Ghana, and the Philippines. Tessa Lark’s technical precision and sensitive interpretation has made her a budding star in classical music, whose Kentucky roots keep her returning to bluegrass and the music of Appalachia. Her performance juxtaposes the DC-area premiere of Michael Thurber’s Violin Sonata, written specifically for Lark, with pieces by John Corigliano, Beethoven, and Stravinsky - an illustration of her ability to oscillate between the classical canon and contemporary multi-genre works. Four instrumental voices melt into an organic whole when Verona Quartet performs the DC-area premiere of composer Michael Gilbertson’s Quartet, which Verona co-commissioned, alongside works by Czech composer Leoš Janáček and Mozart. Notably, Quartet was a 2016 Pulitzer Prize finalist, with the honor ultimately going to rapper Kendrick Lamar. For more information or to purchase tickets, please visit www.strathmore.org or call (301) 581-5100. Lauded by contemporaries and critics alike for her visionary interpretations of surprising depth, immediacy, and communicative power, pianist Yael Weiss brings her dazzling technical skill and expressive sensitivity to bear in 32 Bright Clouds. Her performance at Strathmore launches this new project, with five world premieres by composers from Iran, Syria, Jordan, Ghana, and the Philippines. With this new project, Weiss seeks to respond to current social and political environments in the U.S. and worldwide by harnessing music’s power to convey a message of unity and peace. Says Weiss: “In this particular program, I’ve chosen to focus on the storyline of how the concept of peace is interpreted in each of the new works, both as a purely musical idea and also as related to real-life events in the particular countries I’m presenting.” The project pairs the 32 Beethoven piano sonatas with 32 newly-commissioned short piano compositions from 32 composers in 32 different countries spanning the globe. Known for her astounding range of sounds, Tessa Lark has appeared as soloist with the preeminent orchestras of the world, yet her strong Kentucky roots keep bluegrass and Appalachian music on her roster. Lark also performs as a chamber musician with the award-winning Trio Modêtre and alongside the likes of Mitsuko Uchida, Itzhak Perlman, and Pamela Frank. This performance features the DC-area premiere of Violin Sonata, written for Lark by frequent collaborator Michael Thurber - it will have just received its world premiere in New York two days prior to Lark’s Strathmore performance. The repertoire is emblematic of Lark’s zeal for pairing canonical violin repertoire with more contemporary multi-genre works. Performed alongside Beethoven and Stravinsky, John Corigliano’s STOMP incorporates elements of fiddling and the non-standard tunings found in bluegrass/Appalachian styles. This promising violin talent was a Silver Medalist in the 2014 International Violin Competition, recipient of a 2018 Borletti-Buitoni Trust Fellowship and a 2016 Avery Fisher Career Grant, and winner of the 2012 Naumburg International Violin Competition. Lauded as an “outstanding ensemble” by The New York Times, this exciting young quartet burst onto the scene just five years ago and has already impressed audiences and critics alike with its intensity, expressiveness, and passion for expanding the canon by performing works by living composers. Four individual voices melt into an organic whole that violist Abagail Rojansky refers to as the group’s “fifth member,” “that quartet voice which is an entity to its own,” and which perfectly embodies their “interpretive strength, robust characterization, [and] commanding resonance” (Calgary Herald). This performance juxtaposes the DC premiere of young composer Michael Gilbertson’s Quartet, which Verona Quartet co-commissioned, with works by Czech composer Leoš Janáček and Mozart. Quartet was, rather famously, a Pulitzer Prize finalist in 2016 - the year rapper Kendrick Lamar was awarded the prestigious honor. Strathmore is supported by a grant from the Maryland State Arts Council, an agency dedicated to cultivating a vibrant cultural community where the arts thrive. An agency of the Department of Business & Economic Development, MSAC provides financial support and technical assistance to non-profit organizations, units of government, colleges, and universities for arts activities. Strathmore is also supported in part by the Arts and Humanities Council of Montgomery County. For additional information or to purchase tickets, please visit www.strathmore.com or call (301) 581-5100.